In the 17th century, La Chenevière was an immense property dedicated to the cultivation of hemp which was used to make rope and clothing for fishermen. In the 18th century, the property came into the hands of the Gosset family, who built a large house and gradually made the farm the heart of their vast estate holdings. Beginning in 1880, Gustave and then Pierre Gosset decided to develop the farm and to undertake a number of improvements to the residential premises: another storey was added, as were wooden balconies and a veranda. 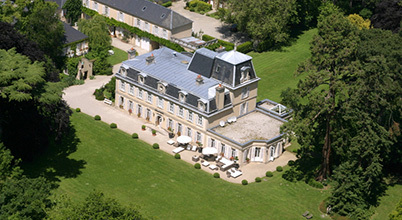 Although the Château today possesses only the memory of those structures, thanks to a number of period photographs, it has however retained the large stables – now converted into guest rooms – which were built in that era to house the estate’s broodmares and foals, that were reared and weaned here before being sent to the Haras de Barbeville, a stud farm owned by the Foy family who prepared them for the famous yearling sales in Deauville. During the Second World War, the estate was occupied by the Germans. Beginning in 1940, an administrative unit lived on the property whose facilities were able to accommodate 70 to 80 horses. The soldiers of the Third Reich stayed in the outbuildings although, at times, a few officers would live in the main house. La Chenevière became the headquarters of high-ranking German officers. Telecommunications posts were established there, and many trucks, motorcycles and cars were stored on-site. During the night of 4 to 5 June 1944 on the Château’s property, Armand Lapierre, a member of the Réseau Alliance network, would participate in the “Grande Coupure”, that aimed to destroy the German lines of communication around La Chenevière before the Allied landing on 6 June 1944. A commemorative plaque in his honour was unveiled on 4 June 2016 in the Château’s park. By the time of the landing, there were no more Germans in the house, and the Royal Army Service Corps would take over from there. The village of Port-en-Bessin and La Chenevière became the point of passage for the fuel which was necessary for the continuation of military operations. Pipes were installed, including a half-dozen around the property, that crossed through Port-en-Bessin to the town of Commes where the tanks were located. Troops transiting through the mulberry harbour at Arromanches could refuel their vehicles at a pumping station behind the house. In 1988, the Château was purchased by Marie-Françoise and Thomas Dicker after 133 years in the Gosset family. Together, they decided to transform this charming location brimming with history into a prestige hotel which they named La Chenevière (“The Hemp Field”), in homage to the nickname given to the building during its early farming days, “la chenevrotte” (“hemp chaff”). That same year, the hotel was certified and assigned a four-star ranking. 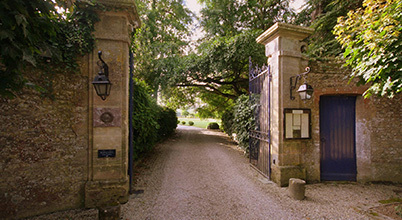 Four years later, in 1992, the manor/restaurant joined the Small Luxury Hotels of the World. In 2014, La Chenevière earned its fifth star. It will be celebrating its 30th anniversary in 2018. 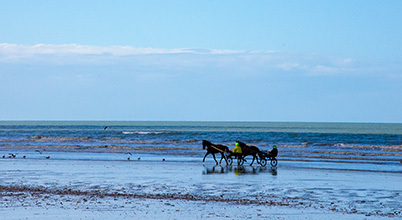 2019 will be the year of new development projects thanks to the financial support of the Normandy Region and of our financial partners. We look forward to showing you around all our new facilities.